The Revolution is rightly called a hollowing 'system' as there is much more to it than just a simple hollowing tool. 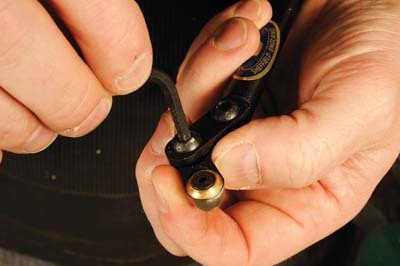 The Revolution includes the following components as standard: handle, 12mm (1/2in) collet, side handle, shaft with articulated 'knuckle' and Super Ring cutter, scraper tips, extender to allow extra articulation, spare Super Ring cutter, Allen keys for adjustment of the tool and instructions on use of the system. The package I received also included the optional extra shear scraper with extender. The Revolution handle has a 16mm (5/8in) collet built in, with two grub screws that tighten onto a 16mm (5/8in) tool shaft or onto various collets available to fit this handle. I did find that the grub screws tended to loosen gradually with vibration in the tool, and I needed to re-tighten them a few times. 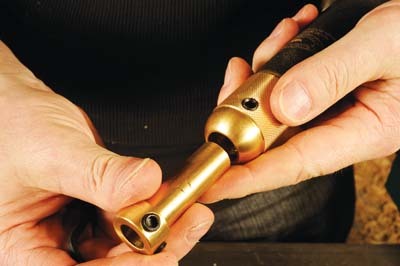 The handle is threaded to accept the brass side handle at the front. To me, this was useful when I needed to use larger articulation on the tool, for example, for an undercut rim, making it easier to counteract the rotational forces caused by the tool tip being so far off-centre. 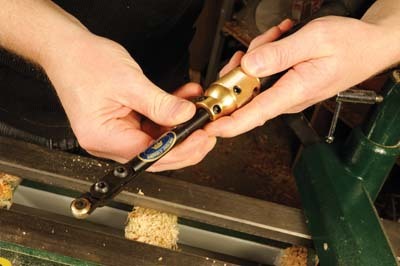 An optional handle extension is also available that screws into the end of the handle to give extra leverage when turning very deep work. The 12mm (1/2in) shaft included was perfect for the 150-175mm (6-7in) deep vessels that I turned with it, and could probably be used for at least another 50-75mm (2-3in) depth. I found at the deepest point that I needed to keep the cuts light to avoid vibration. There is an articulated 'knuckle' at the end of the shaft that allows rotation of the cutting tip for better access into hard-to-reach areas. There is an Extender included as standard that allows further rotation of the cutting tip for maximum flexibility. 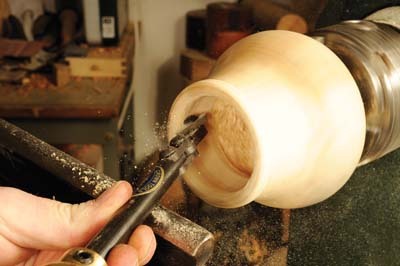 I felt these 'knuckles' allowed very good access to all areas inside the hollow forms I was turning, thus allowing me to achieve the best finish possible from the tool. Without the 'knuckles' I may have been able to access the same areas, but not at the optimum angle, most likely resulting in a poorer finish. This cutter is similar to a traditional ring tool, but it is fitted with a tapered brass adjuster to make it much easier to control. 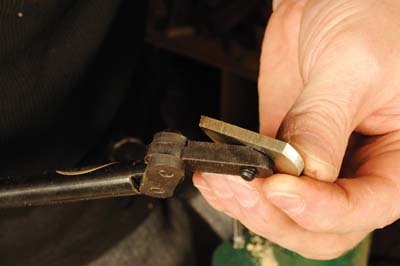 The brass adjuster creates a small 'micro-bevel' on the inside of the ring, thus limiting the depth of cut and preventing dig-ins. 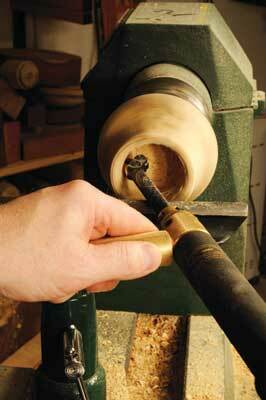 It also deflects the shavings so they don't go through the ring, thus avoiding clogging. The adjuster allows variation of the size of the 'micro-bevel'; there is a mark machined into the underside that indicates the position of maximum depth-of-cut. 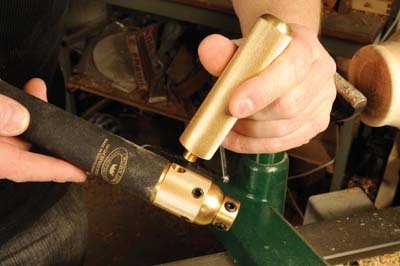 Simply loosening the Allen screw and rotating the adjuster makes adjusting the depth-of-cut easy. The instructions suggest rotating the tool to about 45 degrees so that a shear cut is produced. I found this relatively easy to achieve and found the angle wasn't critical. At the maximum depth-of-cut the tool quickly removed the bulk material. By adjusting to a smaller depth-of-cut, I found I could then refine the profile more slowly and with much more control. Therefore I feel the cutter gives the best of both worlds. The Super Ring tool works best on end-grain work, but I also used it for bulk removal on cross-grain work. For cross-grain work it left too much torn grain to be suitable as a finished surface, but by switching to a scraper tip, I was able to improve the finish with little effort. 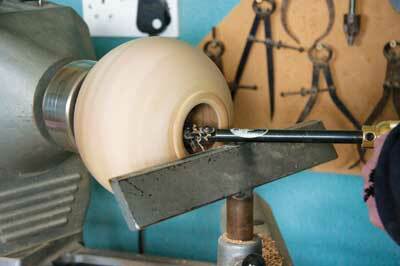 This tool held its edge very well, only requiring sharpening after completing two vessels. 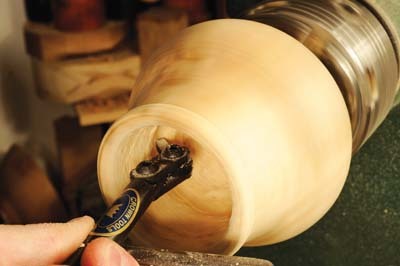 Sharpening is done by honing the bevel with a diamond file. There are four scraper tips, of varying shapes and sizes, included as standard. The suggested uses for each tip are described in the instructions. In general the scraper tips can access more awkward positions than the Super Ring tool, especially the narrower tips. 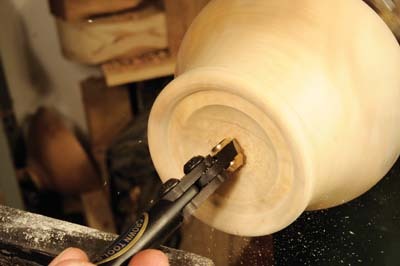 The scraper tips are suitable for both end-grain and cross-grain work, making them very versatile. I found the bigger scrapers took a fairly aggressive bite, but gave a smoother profile, while the smaller scrapers were easier to control. The scrapers are quite chunky, which, in my opinion, makes them easier to hone, although the instructions suggest using a grinder for sharpening. Again, I felt they held their edge well and were easy to sharpen. This is one of the optional extras. It comes with a pre-angled extender that makes it easier to achieve a shear cut. The scraper tip has one straight edge and a complex-curved edge that provides a variation of curves to suit all profiles. 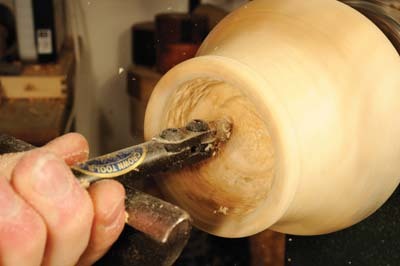 I thought this a very effective tool, smoothing the profile on the inside of the hollow forms and leaving a smooth finish, with minimum torn grain, ready for sanding. 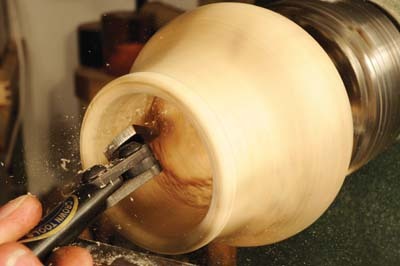 This tool can also be used on the outside of turnings. This is a very well made hollowing system, with all the components tested working well. It is strong and robust, and quite easy to use. The instruction sheet is a welcome inclusion, as it indicates how best to use the tools and how to sharpen them. However, the pictures on the instructions could be better referenced, as they are currently a little unclear. 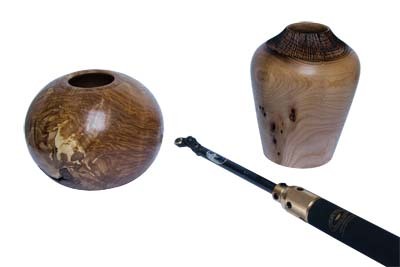 The optional extras available from Crown Hand Tools include: texturing tool, swan-neck shaft, deep hollower, 10mm (3/8in) collet, handle extension, shear scraper and bowl and spindle gouges. Crown Hand Tools say they are developing more tools/parts that will be compatible with this system. All-in-all, I think this system offers very good value for money. 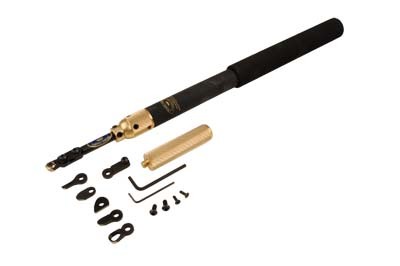 It is expandable with the optional extras, or the handle can be used with any tool with an appropriate shaft diameter. In fact, I am even thinking of buying the Revolution system myself!